Goodbye black top, hello dirt, dust, rocks, corrigates, dust holes etc etc. Need I say more. If we could see through the dust, I’m sure the sign would say ‘Welcome to Cape York’! We should have seen it coming as the tell tale signs were everywhere in Cairns, with plenty of 4WD’s covered in a film of fine red powder! But it’s nothing compared to the real thing! We have a total of 375 kms to travel today, aiming for our dongas at the Archer River Roadhouse. But we haven’t arrived there yet, and are uploading this from Coen which is the last telephone/internet coverage we will get until … not sure about that actually! We rolled out of the Lakeland Hotel/Motel at 6.30 this morning, after repairing a flat tyre on the Vito van, which has been expertly driven in recent days by our professional driver Kevin from Kangaroo Island. Good old Kev to the rescue 😉 Kevin is responsible for ensuring that the camera crew are where they need to be, when they need to be there, so he’s constantly on the move stopping, waiting for The Rattler to zoom past then chasing and repeating it all again. As they pass by, they kick up quite a bit of dust for The Rattler crew to swallow, but nothing like the dust cloud of a road train coming the other way! When they roar past, even with The Rattler doing 80 kmph, it takes several seconds before visibility is restored. 80 clicks an hour you ask with your eyebrow raised … experience in this old girl has taught us that you either cruise at 80 or 10 kmph, so you can stay on top of the corrugated surface and keep better control of the car. She seems to like it that way. Don is doing a mighty fine job of driving today after drawing the short straw. Mark got the other short straw and is navigating after we pryed his hands off the steering wheel of the Landcruiser. So we are signing off for now, as we aren’t stopping for long and need to get back on the move! 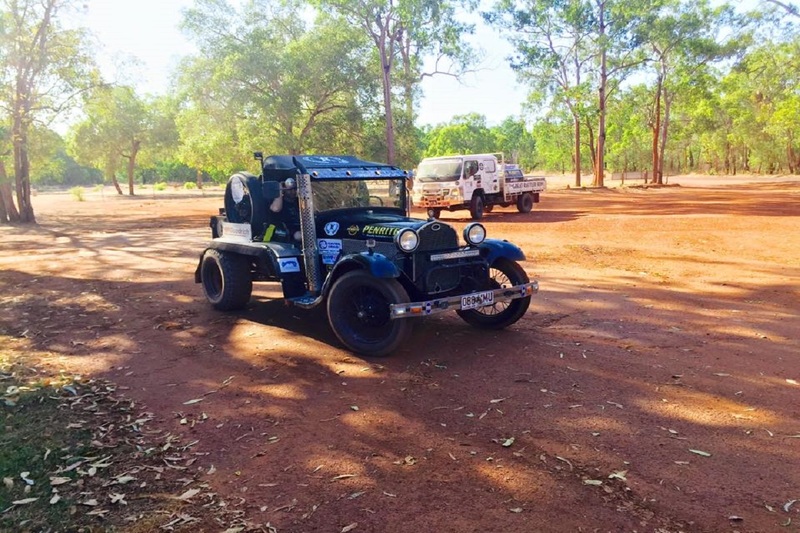 The Great Rattler Run road train made it to Archer River Roadhouse, where we are all now tucked up in our comfy digs for the night. It was supposed to be our second last night before we head out on to The Telegraph Track, but this evening we all discussed a slight change of plans. We planned to stay at Bramwell Station Friday evening and head out to The Track early Saturday morning. But having powered through over 350 kms of dirt roads today, we all agreed that staying at Bramwell would have us sitting around for most of the day twiddling our thumbs as it’s only about 166 kms away. So we devised a cunning plan! We are going to drive to Bramwell, fill up all the cars then just keep going! We may end up in Loyalty Beach a day earlier than planned, leaving us with some extra time to enjoy ourselves after traversing the East Coast of Australia, and of course to walk the last few steps up to the most Northern tip of mainland Australia! So after arriving here this afternoon, the boys and I all decided to prepare The Rattler for the road ahead. We took out the high speed diff that allowed us to travel at 100 kmph and put in the low speed diff which will now slow us down to 80 kmph, plenty fast enough in these road conditions. This way we will be a little more prepared if we do need to put the tracks on to get The Rattler in to or out of any hairy spots! So, the day I’ve been waiting for is finally here and all the months of preparation will come together tomorrow as the crew and I all keep moving North, and take The Rattler to the tip of Cape York, via The Old Telegraph Track! Wish us luck! Because there are bound to be some spots where we are going to need it.